Our Congress is not the sort of formal occasion that the title might suggest! It is an annual weekend event that provides members with an opportunity to share their interests in and knowledge of Netherlands philately. It is a chance to renew old acquaintances and or meet new fellow enthusiasts if you haven't been to a Congress before. The Friday evening of Congress is one for relaxation before the serious stamping. There is an informal dinner and time to socialise in the bar or over tea or coffee. The next morning after the Full English Breakfast (other breakfasts are available) there is a brief AGM as the office bearers give an account of the year (maximum 30 minutes, business before pleasure!). The day then continues with displays on a wide variety of topics. Members can contribute at whatever level they wish. Some may have a question that needs airing; chances are that someone can help you. In the meantime spouses or others can explore the local area. Possibly, there is a National Trust property or museum fairly nearby that can be visited or people can wander round the local shops or garden centre. After lunch there is an auction, providing an opportunity to purchase interesting material. This is followed by some more members' displays. The philatelic programme of Congress for the day finishes with a Beurs or bring-and-buy sale. In the evening there is a private dinner which is usually followed by a talk or some other entertainment. The Sunday follows the same pattern of displays followed by a buffet style lunch to bring the weekend to a conclusion and allow members time to travel home. For those travelling long distances, or wanting to spend more time exploring the local area, venues normally provide special rates for additional accommodation before or after the Congress. This year we are returning to Hitchin Priory, Hitchin, Hertfordshire after having a very enjoyable weekend there last year. We will once again be joined by members of the Belgian Philatelic Circle. A summary of the displays gives an indication of the wide range of topics that were covered. The Postal History of Amsterdam - this was a comprehensive selection of material of the capital, starting with a 1654 Messenger mail item sent from Amsterdam to Antwerp. The 19th century was well represented, including material from the French occupation and items illustrating the development of the Dutch postal system. The stamps of 1852 and associated postmarks and following issues with the development of different postmarks were illustrated. The display also included examples of postmarks of the Amsterdam sub-offices on Registered mail. Foreign Sorting Marks Belgium-Netherlands - the end of the War of Spanish Succession was followed by the Treaty of Utrecht in 1713. Examples of various marks that were applied to mail from the Netherlands e.g., HOLLANDE, de HOLLANDE and H in a circle, were shown. In 1794 the French occupied the area and brought in a new postal system; examples of mail from this period were shown. After Belgium's independence in 1830 the Belgians started using different postal markings and with the Belgian development of a dense railway system postal traffic increased and it is possible to find 13 towns where mail was exchanged with the Netherlands. Ghent-Terneuzen Railway - this privately-run railway linked Northern Belgium to Southern Netherlands from 1879 till the 1930s. The display showed the Railway stamps and cancellations noting the development of the postmark shapes and it was also noticeable that some of the French place names were changed to Flemish equivalents. KLM - the first section of the display focused on examples of the Propeller Propaganda marks which were applied to incoming mail air mail items in the main Dutch cities, Amsterdam, Rotterdam and 's Gravenhage, over the period 1928-30; these were applied in a variety of colours black, red or violet. The second section showed examples of air mail carried by the Specht or Woodpecker; this was the second DC2 plane which made 5 flights to the East Indies. The 6th flight finished in a crash as shown by a photograph. Netherlands 1940 Konijnenburg Issues - this distinctive Netherlands definitive issue appeared one month before the German Invasion and occupation. The stamps were only available for a short time before alternative designs were produced by the Germans as the Queen had left for Britain. Postal stationery items were available but had to be uprated as postal rates were increased. Other uses of the image as an imprinted stamp which appeared on Working Hour posters, postal order forms and railway letter cards were shown. One source of uses of the Konijnenburg High Value stamps was to pay for postal identity cards and post office box cards for renting of post office boxes. Dutch Express Mail - this consisted of various examples of the definitives used on Netherlands mail dating from the1940s to 1980s. The rates from 1948 to 1990s were illustrated and rates calculated. Another section was devoted to stamp exhibitions from the Centenary Exhibition in Utrecht in 1952 to AMPHILEX in 2002. A final section looked at machine cancels with a postal theme. Netherlands Postage Dues - this display showed examples of the issues of postage due stamps, the changes in charges and examples of their uses, starting with the first issue in 1870. It was noted that the 1881 issue is quite complex. In 1908, window envelopes were introduced such that the addressee could not read the message on an unfranked postcard and so refuse to pay the deficit. In 1960 the PTT switched to applying a machine cancel stating the amount due. The current system involves a postcard stating the deficit and the addressee has to return the card with stamps to the appropriate value to the post office. Netherlands and the Second Boer War - the display showed mainly mail exchanged between the Netherlands and Prisoners of War from the Hollander Volunteer Corps (HVC) held in POW camps in South Africa, Ceylon and St. Helena. It also included some relevant picture postcards and some non-prisoner covers. Netherlands Indies WWII Censorship - examples of censored items from the period June 1940, following the capitulation of the Netherlands, through to early 1942, when the Japanese completed their occupation of the Netherlands Indies. It included a number of covers illustrating the different routes by which mail was carried to Europe and the US as the war progressed. Introduction to Aspects of Postal Censorship in the Netherlands Indies 1940-42 - the inspiration for this display was the book recently produced by Messrs, Piet van Putten and Nico de Weijer, Postal Censorship and Internment Camp Mail in the Netherlands Indies 1940-1942. The display was dedicated to various members of Julian van Beveren's family who lived in the Netherlands Indies during this period; some of whom were subsequently interned or imprisoned by the Japanese. This display was in-depth study of the various aspects of Dutch postal censorship in the Netherlands Indies during this two year period, leaving much of the internment camp mail covered in this book for another day, albeit a few Red Cross covers from such places were included. Indonesia 1956-1966 - this was a continuation of last year's display that covered the early years of Indonesian stamps and postal history. Initially, the stamp issuing policy was quite conservative and subjects were relevant to Indonesia events. But from 1961 onwards the issues grew more frequent; the sets became longer (24 stamps in the case of 'Asian Games IV') and the stamps bigger, probably to appeal to the thematic collector. Rampant inflation also resulted in the frequent re-issue and overprinting of the definitive issues. WWI Censorship - this display focused on the use of censor labels with the text Opened by / Censor plus a number. Some also had the letters P.W. before the number indicating Prisoner of War mail; although later some of these had the letters deleted as they were used for ordinary mail. A graph showing the number of censors at work over the war years showed the numbers rise from 10/20 to 6,000 at the maximum. This year's Congress was held at the Cottons Hotel and Spa, Knutsford and for the first time, we invited members of the Belgian Philatelic Study Circle to join us for the weekend. The result was a success and we intend to do this again next year. The venue was very comfortable and we saw a great variety of displays, some twenty in all, of various aspects of our hobby. In terms of time period the material ranged from the Golden age of the 17th century to fairly recent releases from Groningen. The postal practices ranged from the use of crayon to indicate the charge to be made of the recipient to the use of bar codes in registered mail. We had seventeen members at the meetings which included 5 Members of the BPSC, one of whom was a member of both societies. The scale of displays ranged from 10 frames to a talk centred around a blank sheet of paper, although the sheet of paper was an example of that used for the 1852 first issue of the Netherlands! We also had an auction, with a wide range of interesting lots, and an opportunity to buy unsold items from the last two postal auctions. Tatton Hall was an interesting local place to visit for those not interested in philately. Our Saturday evening dinner was followed by a quiz. Julie Longbottom presented a large number of old household objects, many borrowed from a museum, and challenged us to explain what they were used for. This proved very entertaining as some of the participants' explanations were quite bizarre! A summary of the displays gives an indication of the wide range of interests that we cover. Mail between Netherlands and Belgium in the Spanish and Austrian Periods. This display covered the period from the early 1600s to the later 1700s. Much of the mail was carried by the Thurn and Taxis system but some local carriers were also involved. Interesting examples from both the Spanish Netherlands and Austrian Netherlands were shown and explained, although most examples were from the Spanish period. A Piece of Paper! A letter from an International Stamp Exhibition in The Hague in 1901 thanked the sender for a submission and stated that it was being returned. The contents comprised a piece of unused paper for the Netherlands first issue. The posthorn watermark could be fairly easily seen. However it seems to have been rejected as an exhibit due to its poor quality and the impression given was that the organisers had seen better examples. A Celebration of Dutch Postmarks. This display started with the first issue, then puntstempels, takjes, straight-line towns and double ring cancels. Machine cancels start to appear in 1905, followed by slogan postmarks in the 1920s. A wide variety of slogans were shown, including those used at the beginning of WW2 and more recent ones. Antwerp-Amsterdam TPO. This is a notable TPO route because it was international. The display started with early forerunners which were not TPOs as a through route did not exist because mail was carried by ferry at Moerdijk. A through route existed when the Moerdijk bridge was completed in 1872. The display then showed the progression of marks which appeared on the route going both ways with small round, large round, bridge and then blokstempels up until 1970. Post Besteller Marks. The bestseller marks were applied by postmen initially to indicate on which round of deliveries an item was delivered and, later, the identifier of the postman doing the delivery. The earliest example was from 1848 where the number 4 in a circle on an envelope indicated that it was delivered on the 4th round of deliveries. Later in 1856 an example of blue crayon and '28' would seem to indicate the number of the postman. Various towns began to use chops of different shapes. The Hague devised a system combining the postman's number with the number of the delivery. This became the standard system and various shapes were used including circles, ovals, oblongs and lozenges. After World War II the system gradually fell out of use as it was rather time-consuming. Postage Dues. This display took us through the complexities of the Netherlands 19th Century postage dues series. The series has 4 types and for each type there were 4 perforations. The colonies also produced postage dues but in differing colours. The Indies of that time were red while the Suriname version was lilac. The SS Berlin Disaster. The SS Berlin sailed on the ferry service operated by the Great Eastern Railway Company between Harwich and the Hook of Holland. On 21st February 1907 the ship struck the breakwater at the entry to the New Waterway leading to the Hook of Holland. The result was the ship sank and of the ship's complement of 120 passengers and 60 crew only 15 survived. The display included material advertising the ferry service and ship, and a contemporaneous account of the event printed in the Telegraaf. Some mail was recovered and examples, with special labels and cachets were shown. Dutch Internment Camp Mail. Large numbers of Belgians were interned in the Netherlands during WW1, together with some Britons and Germans. Examples of mail from different internment camps were shown with various handstamps. Some examples of the use of the Green Internment label were shown; the use of these labels as short-lived as the Germans refused to accept these labels and mail was returned. Small Reflections on The Great War. The Western Front featured on the cards and covers of this display, which focussed on aviation and particularly the Royal Naval Air Service (RNAS). The display started with some fore-runners of flight which had only just preceded the outbreak of hostilities such as the lighter than air balloons which would become the drones of the day. Early (pre-1914) cards from Belgian addresses showed aviators in the flimsy looking machines. There were German propaganda cards on the Zeppelin air raids. The airmails on display were of a military nature and were flown by the RNAS between the Headquarters in France and that in London. The first RNAS cover was dated 9 Sep 1916 "VENDOME" and has over the address of the London RNAS mail office a mark dated 12 Sep1916. The display finished with the early First Flight from London to Brussels. KLM Branding. The variation in how the airline promoted itself was the theme as shown by items like the postcards issued to passengers over a period from the late twenties to the sixties. These cards started by showing planes and the associated logo for the company with the Dutch crown and the initial letters. This generally changed to focus on the initial letters and thence to the theme of the Flying Dutchman which was emblazoned on the fuselage of the aircraft. It was particularly noteworthy if the meter marks could be found on the airline's stationery. POKO Perfins in interrupted Perforations of Veth Issue Stamps. The POKO machine for creating Perfins was of German manufacture and dispensed the stamps in several rolls. Photographs of this type of machine started the display. Examples of almost all the stamps with company initials were then shown. The stamps illustrated various interrupted perforations and were arranged in alphabetical order from AEG to companies whose initial was a "V". Censored mail from the Netherlands 1939-1947. This display started with examples of mail from the period the period when the Netherlands was neutral,including a cover posted a day before the German Invasion in May 1940. Examples of censorship during the German occupation were shown. Censorship of the mails to Germany and Austria was carried on till 1947 and would have been carried out by Dutch postal workers. Harwich-Hook of Holland Ferries after WW2. This main part of this display included postcards and cachets from ferries that operated between Harwich and the Hook of Holland from 1946 to 1967. A major change in the ferry service occurred in 1967 when new roll-on roll-off (RoRo) ferries were introduced and the older ferries were sold or scrapped. There were also some postcards and cachets from the train ferries which plied between Harwich and Zeebrugge and the short-lived Harwich-Ostend service, to show the Belgian connection with Harwich. Europa Issues of Belgium and the Netherlands (1956-2015). The initial Europa issue was that of the omnibus 1956 issue produced by the six original members of the Iron and Steel Community who had also agreed to co-operate in postal matters. This was reflected in adoption of common designs until 1973. From 1974 there were different designs but followed a common theme. While Belgium produced issues every year there were gaps in the Dutch authorities' production of annual Europa issues. Bar code use in the Netherlands Postal Service. This display focused on the black and white bar codes used on modern registration etiquettes in Belgium and the Netherlands. The various elements of the row of black lines and white spaces which make up the code were explained very clearly and examples of use were shown. The use of a bar code reader revealed an error in one the Netherlands miniature sheets of 2001 produced for Amphilex 2002. The bar code on the stamp is different from the "human readable" text below. Mooi Nederland. The Mooi (Beautiful) Nederland series of stamps have become a regular series of images of that country. The series had started in 2005 with a miniature sheet of 5 stamps of Nijmegen but as the sheets accumulated it became clear that after five issues there would be a summary (or Collectors) sheet which comprised one stamp of each of the previous five issues. After a series of towns the topics have branched out into various other themes such as country seats, headdresses, pottery and fortified towns. KPM Mail. The Royal Dutch Packet Company was founded in 1888 and had a monopoly of the trade in what was then the Dutch East Indies and in the early 20th Century its trade extended to Australia and across the Indian Ocean. Its philatelic interest is that it had postal agents on all its ships up to WWII (up to 200). The mail carried was not just that of the passengers but was also used by the inhabitants of the outlying islands as it speeded the mail. Although Dutch Indies stamps would have been available, other foreign stamps would be used when in other waters so examples of Straits Settlements, Australian, Mozambique and East Timor (Portuguese) were shown. The Postjager Flight and Stamps of New Guinea. The Postjager was built to shorten the flight times for mail to Dutch East Indies. On its maiden flight it got as far as Brindisi where it broke down. The mail was carried by Imperial Airways and eventually reached its destination on the Pelikaan. Examples of mail from this flight were shown. The Xmas Flight of 1934 to the West Indies was also included. The route was from Schiphol to Marseilles and then by stages to Venezuela and finally to Curacao. The focus then went to the New Guinea stamps issued from 1950 till 1962. In October 1962 the UNTEA overprints on stamps of birds of paradise and Juliana reflected the transition from Dutch rule to that of the Indonesian Republic under the supervision of the UN. Indonesia 1945-55. Following the end of the Japanese Occupation, there were two parallel postal systems operating in Indonesia and examples of both were shown. The Dutch controlled the urban areas, while the Indonesian Army controlled the other parts of the country. The Indonesians overprinted both existing Dutch and Japanese issues and there were also some propaganda issues. The Republic was declared in August 1950 and the early stamps of Indonesia were shown. Eighteen members, many accompanied by spouses, gathered at the Abbey Hotel, Redditch on 27 March for the 61st Congress. The business of the AGM was conducted quickly on Saturday morning and the rest of the morning was devoted to displays. After lunch, this year's auction consisted of about 60 lots and there was fairly spirited bidding on several of these. There were then more displays and then the afternoon programme finished with a Beurs including some massive boxes with material at reasonable prices to browse through. Saturday evening saw a private dinner which was followed by a talk from Chris Jackson, a Postal History collector, who had amassed material relating to the local needle industry. At the end of the 19th Century, Redditch was the source of 90% of the world's needles. Diversification saw the development of fish hooks and surgical needles. He gave examples of the extent of market reach and marketing stationery with illustrations of factories gave an idea of the success of the industry. One of the effects of globalisation was shown when a new CEO of the firm which manufactured high quality needles came into the boardroom and brusquely ordered that the displays of salesmen's sample cases and other items should be dumped. Chris relates how he re-christened his room as SKIP and asked the men that the offending material be diverted to his office. In this way some of the archive material on show was saved from the local tip. The Sunday followed the same pattern of displays and a buffet style lunch brought the weekend to a conclusion as the members went home no doubt refreshed. This year's displays illustrated the wide diversity of interests within Netherlands philately. Alan Bartlett's display on A Belgium Enclave in the Netherlands presented material related to Baarle Duc, a curious anomaly being a part of Belgium entirely surrounded by the Netherlands. This led to some interesting problems, especially during the First World War when Belgium was occupied by German troops and the Netherlands remained neutral. Mike Griffiths showed Dutch West Indies Airmails covering the development of the early airmail routes. The Americans pioneered the first routes to Paramaribo in Surinam, starting with Lindbergh's 1929 flight from Miami to Paramaribo and back to Trinidad. The display continued with various other flights developing routes to Paramaribo. The display finished with the KLM service starting in 1934 from the Dutch East Indies via Amsterdam to the Dutch West Indies, a total distance of 14,000 miles! Philip Longbottom's display A Miscellany of Letters started with a letter of 1695 from the Bank of England. He then showed a variety of covers illustrating the different postal rates and marking applied to mail on cross channel routes. These included two related letters from the Corsini correspondence and a letter carried on the first steamer used by the Royal Mail to the Netherlands in 1832. Julian van Beveren showed The Colditz Story - The Dutch Guests; philatelic items relating to Dutch officers captured by the Germans in 1940 and who eventually reached Oflag IVc - Colditz Castle. There was a personal connection as one of Julian's aunts maintained a correspondence with one of the POWs after he received a food parcel she had sent. John Henley's The Netherlands as seen from Abroad consisted of a selection of stamps that depicted aspects of the Netherlands life and art. This was an original approach including some stamps from quite unusual places with no obvious connection with the Netherlands. Les Jobbins' display of The Veth Issue of The Netherlands covered the period from 1925 to 1940 and included a wide range of covers showing the use of these stamps. These included a 1927 receipt with stamps to the value of 145 fl. 89ct and a cover retrieved from a train fire in 1930. Rosemary Dellar's Netherlands New Guinea included a section on Manokwari, a small port surrounded by mountains and impenetrable jungle. This included covers from the 1930s and a first flight cover from Soerbaja to Manokwari in 1940 together with a cover for the return flight. Michael Cooke showed Netherlands World War II covering various aspects of wartime mail, including a major section about the German postal system in the Netherlands during the war. There were also examples of: mail to an undercover address; mail from a prisoner in a concentration camp; propaganda leaflets dropped by the Allies and contemporary postcards. John Lauder's A Celebration of Netherlands Postmarks was a wide ranging display of different types of postmarks starting from 1852 half round cancels used on the first issue and included puntstempels, early machine cancels, special handstamps, flight covers, exhibition cancellations, railway letter services and maritime mail. John W. Jackson's display Netherlands Steamship Company (SMN) provided a comprehensive coverage of mail carried by this company that operated from the 1870s to 1970 on routes between the Netherlands and the Netherlands Indies. From 1904 post agents travelled on the ships and postal markings were applied to mail. During the First World War ships had to go round the Cape of Good Hope, because German submarines were operating in the Mediterranean, or go across the Pacific. Paul Mc Gowan's Netherlands World War I consisted of a selection of covers and cards illustrating the fact that although the Netherlands was neutral the War had an effect on the country. Items shown included: Veldpost covers for the mobilisation of the army; mail from British troops interned in the Netherlands; the labels produced for use by internees that were not accepted by the Germans; and examples of parcel cards relating to parcels sent to POWs in German camps. Members and their spouses gathered at the New Lanark Mill Hotel on March 21st 2014 for the 60th Congress. Philip Longbottom was elected President at the AGM and thanked the Peter Hardie, the previous President for his hard work over the last three years. Members were treated to a wide variety of material on the Netherlands and the Colonies while the spouses were exploring the World Heritage Site or travelling to Chatelherault Country Park. Les Jobbins gave The First Issue of the Netherlands with examples of all the plates of the three values as well as a contemporary booklet which explained to the Dutch people how the mail rates and distances should be calculated. This was followed by Philip Longbottom showing Origin Marks. The Second World War censorship marks and labels in the Dutch West Indies was the focus of Ray Wellands display. Mike Cookes Interwar Netherlands looked at examples of mails between 1919 and 1940. Julian van Beveren gave the first part of his displays on UNTEA, the period in 1962-63 when the United Nations oversaw the passage of power from the Dutch in New Guinea to the Indonesian Republic. After an auction the displays started again with Lenny van der Berg showing the Netherlands Miniature Sheets and Booklets from 1944 to 2000 a period in recent years when there has been an explosion of issues. Les Jobbins showed Netherlands Fishing Permits. This display related to a requirement for amateur and professional anglers to have a permit which for a period from 1976 to 1991 used labels showing fishes and were purchased from the post offices. Netherlands Change of Address Cards a range of the cards were shown by Mike Griffithsfrom the earliest to more recent. The insertion of lines like telephone number and postcode illustrated the chenges in communication over the years. The final section was started by John Jackson who gave us his Netherlands Konijnenburg Issue. These stamps appeared in April 1940 and covered much of the Occupation period before being invalidated. So there was interrupted mail and much of interest. After the Liberation they were re-validated and high value issues appeared. Alan Wishart showed early postal history items of Rotterdam. This began with a merchant letter of 1652 with a rate of three stuivers. Examples of the period of French influence were shown including the use of Departement 119 on marks in the French Occupation in 1810 and then the same postal mark but with the 119 removed. At the Dinner Les Jobbins intimated that the Isa Stuart Award would be given to Julian van Beveren this year in recognition of the vast amount of material which he had contributed to the publications such as the Journal and the newsletter and several major displays to Congress. On the Sunday there was the second part of Julian van Beverens UNTEA material with the focus on the Middle Period when matters were handed over to the Indonesian authorities. A lot of the Post Office staff left and some Delivery Houses closed. Some of the handstamps were shown with reference to Netherlands New Guinea cut out. Julian then showed a display of material relating to World War I starting with a timeline and then various postcards and postmarks including some relating to mail carried by air in military matters. The final session was taken up by a Dutch Miscellany by Paul Mc Gowan with a section showing early letters dating from 1690 to and from the country. Then a section was devoted to the ongoing battle against the sea with material relating to the Zuider Zee project of reclaiming land from the sea and sea defences. This was followed by some KLM material postcards and official stationery used in the Company. Seventeen members with many spouses gathered at Three Swans Hotel, Market Harborough on Friday 12 April for the 2013 Netherlands Philatelic Circle Congress and we had a splendid time with many interesting displays. The displays started with Philip Longbottom giving his review of the early Registration mail of the Netherlands charting the development of handstamps through to the etiquettes of pink, purple and orange and finally to the standard UPU in 1907. There followed a section of brief displays from the following members: Simon McArthur, Lyel Swingler, John Henley, David Cletheroe, Mike Griffiths, John Hill, Julian van Beveren and Len van der Berg. Simon and Lyel were displaying at their first Congress. In the afternoon there was a Congress auction with some keen bidding. Julian van Beveren gave a splendid look at early Dutch Indies air mail material in his display called "I Can See a Speck", a reference to a letter written by a lady on seeing the Vickers Vimy plane arriving in 1919 on its way to Australia. Alan Bartlett showed a selection of postal material from one company in the Indies and later Indonesia. The company was called Maclaine, Watson and Co. An early letter to Addison of Appleby in 1790 went per overland mail, relating to a large load of spices. This was followed by a selection of material relating to Hollandia in the Netherlands New Guinea. Located on the northern shore of the island settlements with similar names occupied various sites such as Hollandia Binnen over a period of time which included the Japanese invasion and subsequent Liberation by American forces in late 1944. A point of interest at the Dinner, Peter Hardie as President proposed the toast of the Two Queens for the last time in view of the fact that after 120 years a King, Willem-Alexander, has been inaugurated to the throne in the Netherlands. On the Sunday, April 14, Les Jobbins gave us a display of Netherlands International Parcel Cards. He started with lists of dates when various countries took part in the service with 17 countries participating in 1880 various improvements were introduced with Cash on Delivery etc., Express, Urgent, Air Mail and Urgent Air mail appearing at different times. The service ended in 1970. Rosemary Dellar brought some more information forward as to 'Who was T.M. Prentice?' Her curiosity had been aroused as she came across the Addressee on several FDCs. The answer will appear in an one of the Netherlands Philatelist magazine. The Konijnenburg image of Queen Wilhelmina in 1940 was the subject of John Jackson's display. There was much of interest in the issue because shortly after its appearance neutral Netherlands were thrust into the war and examples of interrupted mail and changing rates were much in evidence. A thematic display of Dutch football by Paul McGowan included items from the KNVB and covers in the World Cups. 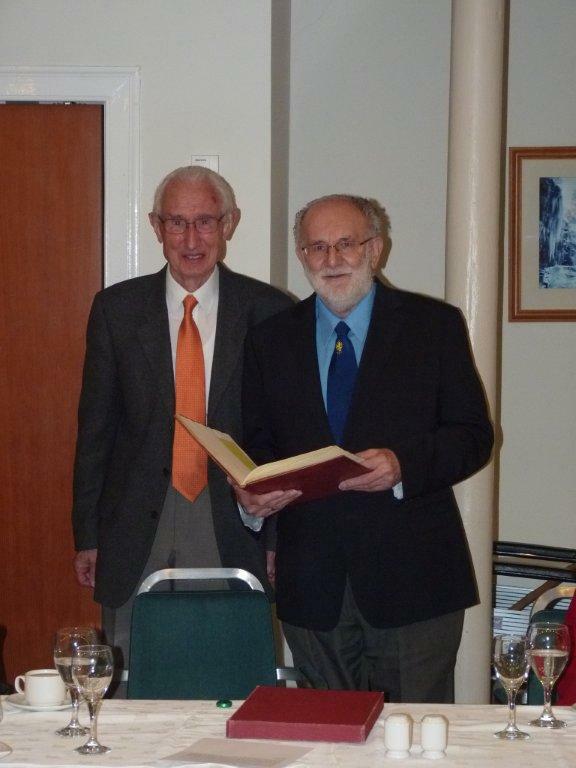 This year the Netherlands Philatelic Circle returned to Scotland where it started over 60 years ago. The venue, the New Lanark Mill Hotel, is located on the banks of the River Clyde in a World Heritage Site. Congress was a great success this year, with attendance up from last year. 22 members and spouses attended for the weekend and 13 of them displayed a wide range of material including airmails, shipping, rocket mail, Dorus Rijkers, banking, WWII, Dutch East Indies, Bontkraag, kinderzegels and Rotterdam postal history. The visitors from the South enjoyed the event too, and the spouses were content to visit the various parts of the World Heritage site and the town of Lanark. The close proximity of all that meant that their stay was considered relatively relaxing, with no long journeys to stately homes, etc. The Book of Signatories of the Isa Stuart Award was signed by Alan Bartlett. Alan has been a stalwart of the Committee for many years. He has attended every Congress since 1999. He was Vice President and Public Relations Officer from 2005 to 2008, and President and Public Relations Officer from 2008 to 2011. He has produced 19 articles for the "Netherlands Philatelist". After the dinner Julie Longbottom (wife of Philip) gave a display of some of her artwork including paintings and ceramics. Sixteen members and spouses met in Morley, Derbyshire, on the weekend of 8th to 10th April 2011 for the Annual Congress of the Netherlands Philatelic Circle. The weekend was notable for the extremely fine, sunny weather which we all enjoyed at the venue which looked out over the rolling Derbyshire countryside. 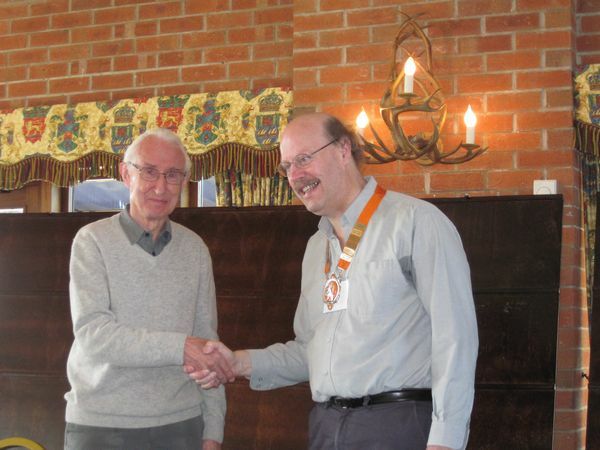 Peter Hardie was installed as President and received the chain of office from the outgoing President, Alan Bartlett. On the philatelic side nine different displayers showed a wide variety of items from the early years' material, airmails and the Dutch East Indies, which were all hugely enjoyed. They even had a gentle competition to spot the years in different catalogue pages. The philatelic widows and widowers were able to roam around the immediate countryside with a number of them visiting the Crich Tramway Village. The dinner was most enjoyable and was followed by a talk by Nick Wraith, retired managing director of Cavendish Philatelic Auctions Ltd, on the development of postal services in Great Britain with an explanation of how letter carriers turned into postmen with the introduction of the parcel service in 1883. At the Dinner, Les Jobbins announced that the Isa Stuart Award was to be given this year to Paul McGowan for his work as Secretary, Newsletter Editor and Editorial Contact in recent years. One of the highlights on the Sunday was a comprehensive display of World War Two Undercover Mail by Tony Sibley. After Lunch the members dispersed and were looking forward to next year's Congress which is planned to be held at New Lanark. Many of the early Congress meetings from the late nineteen forties to the mid sixties were held in the Glasgow area. We returned to the Charlecote Pheasant Hotel, Charlecote, near Stratford-upon-Avon following a very successful and enjoyable Congress here in 2009. 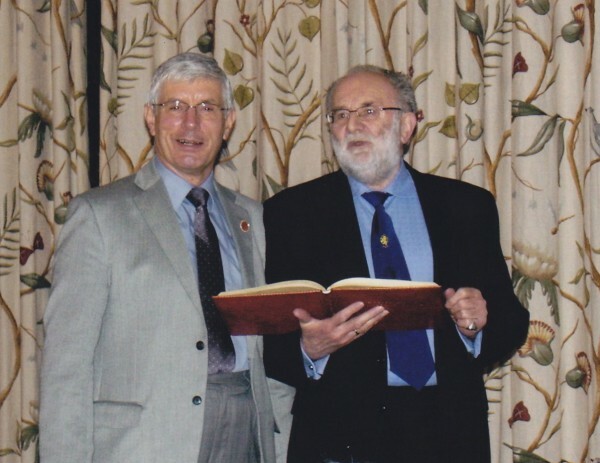 At a very successful Congress, Philip Longbottom (on the left of the picture) is shown receiving the Isa Stuart Award from Les Jobbins, the Archivist and Keeper of the Award.